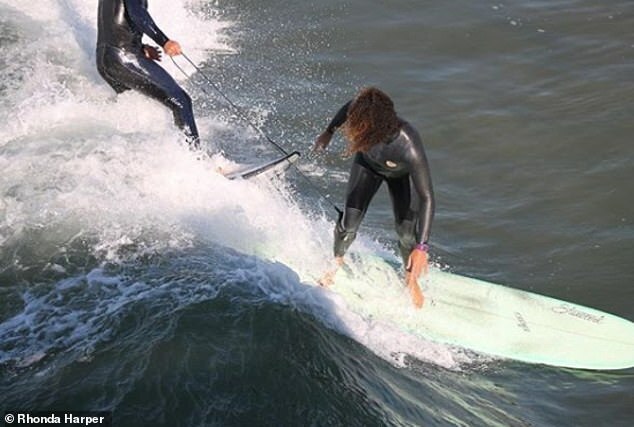 A surf school owner in California has been criticized after aggressively pulling a female surfer’s leash and causing her to fall at at the Venice Pier. Surfer Danielle Lyons was riding a two foot wave and clearly had right of way when a surfing instructor dropped in behind her, grabbed her leg leash and tugged hard enough to cause her to fall. 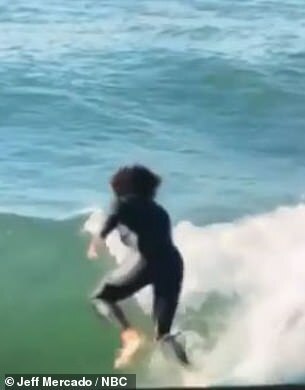 The incident occurred Tuesday morning alongside the Venice Pier in Southern California and it was recorded on video. Wagner Lima, owner and operator of the Brazilian Surf Club, has been criticized over the incident which could have ended a lot worse. ‘I was up and riding on the peak and [Wagner] decides to try to block me, so I turned around him, then he drops in behind me and pulls my leash causing me to fall, ‘ explained Lyons in Yelp review for Lima’s business. ‘Not only is what he did super dangerous, it’s assault’. ‘In all my years of surfing I’ve never been attacked unprovoked like this. ‘I gave this guy every opportunity not to be a [jerk]…I even gave him room to share if he was that hard up for a two-foot wave. ‘I’m not sure if this was localism, racism or sexism. There were two black women in the lineup and he targeted me for whatever reason’. Rhonda Harper, owner of Black Girls Surf, told The Inertia she and Lyons were hosting Senegalese surfer and Olympic hopeful Khadjou Sambe while NBC was shooting a profile on her. Harper shot photos of the incident from the pier and NBC captured video and allowed her to use it. Harper told Inertia: ‘[Lima] was acting aggressively the minute the girls started to paddle out in the water’. ‘Even before he went out, he came on the pier and asked the camera crew from NBC who they were filming’. Lyons also wrote in her review that once Lima was aware of the tapes he tried telling people ‘he accidentally pulled my leash, that his arm got caught’. However video and a photo shows him grabbing the leash with his hand.